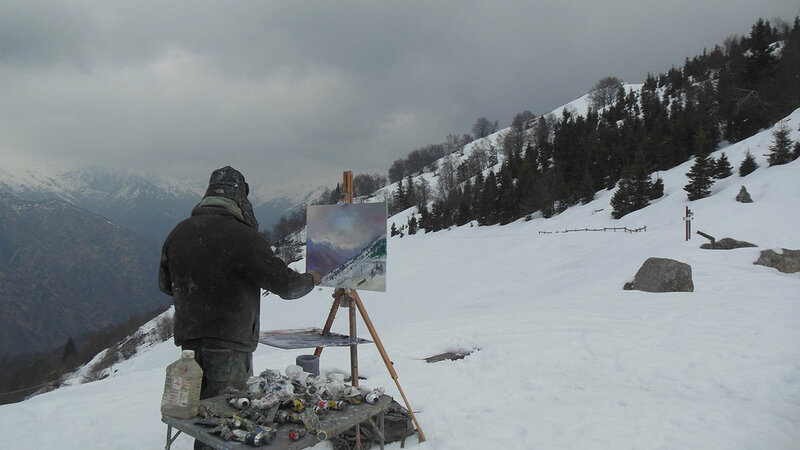 Painting at 4000ft from Mosso near Bielmonte in Italy. Painting the stunning, panoramic view towards Monta Rosa from Mosso in Italy. It looks a lot colder that it actually was. It was so quiet too. This is my second trip to this region of Piedmont in Northern Italy and the winter conditions have provided a much different experience and challenge from the ones encountered last spring. I am here for a few weeks to further explore the region and revisit some of the places that inspired me last time. (daivd-atkins.com). My thanks to Manuel Capella for sending me the photo.